The green-eyed boy sat alone in the food court and fingered the needle in his pocket. The syringe was empty and unused, he had no use for the syringe. He had use for the needle. The green-eyed boy -- he was called Roman, but what you will have seen first was the eyes -- wore a tailored Milanese blazer, one hand in pocket, and blue jeans. He was pale and lean and as handsome as a hatchet, and in egregious style and snobbery a hopeless contrast from the suburban mall food court where he sat and looked in the middle distance and fidgeted with the needle in his pocket. And then he saw the girl. The blond girl at the Twist in pumps and a mini- skirt, leaning in that skirt as though daring her not to, or some taunting mystic withholding revelation. Also, he saw, alone. Roman rose and buttoned the top button of his blazer and waited for her to continue on with a cone of strawberry, and when she did he followed. Maintaining a discreet distance, he followed her through the main concourse and stopped outside a women's apparel store as she entered, and he watched through the window as she browsed the lingerie and finished the cone. She looked around and stuffed a mesh chemise down her purse and exited the store. Her tongue darted to collect crumbs from her lips. He continued following her to the parking structure. She got into the elevator, and seeing there were no other passengers, he called Hold please, and jogged to the car. She asked him what level and he told her the top, and this must have been her floor as well because it was the only button she pressed. They rode up and he stood behind her smelling her trampy perfume and thinking of the underthing in her purse and silently tapping the syringe through the fabric. "You ever close your eyes and try real hard and trick your brain you're actually going down?" said Roman. The girl didn't answer, and when the door opened she stepped out curtly, like he was some kind of creep when he was just trying to make friendly conversation. But so it goes. The game as it were afoot. A few minutes later she opened the door and leaned over and spat. Roman's hands unlaced and his arms came down and as they did his hand fell naturally to her lower back, and just as naturally he rubbed. Nothing weird about it, or even a thing you think about, you rub a girl's back because it's there. But at the feel of his touch she recoiled abruptly and straightened. Roman was confused. "You don't like that?" he said. "Oh no, baby," she said. "I think it's totally hot." "It'll take a hose to get the smell of prole out of my nostrils," he said. "Poor baby," she said, neither knowing nor making any attempt to care what he meant. "You know my name?" he said. "Yeah," she said. It would have been pointless to say otherwise, everyone knew his name. He looked at her. "No you don't," he said. 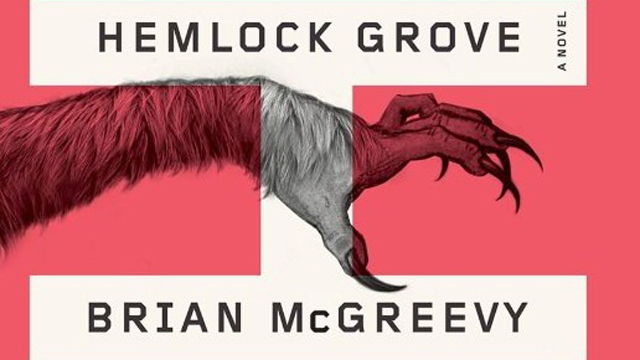 Brian McGreevy is the author of Hemlock Grove, as well as creator of the Netflix series of the same name. Born in the Pittsburgh area, he dropped out of high school in the ninth grade, citing "creative differences." A former James Michener Fellow at the University of Texas, he is a founding partner of the production company El Jefe.